This document provides general guidelines for preparing the environment for PHP development, setting up a PHP project, and developing and running your first PHP application in the NetBeans IDE for PHP. You can install the PHP engine, web server and database separately or use AMP (Apache, MySQL, PHP) packages. The following documents contain instructions for one or two ways to set up a PHP web stack on your operating system. These instructions are not definitive. The web stack consists of third-party software, your environment may differ, and you might prefer a different AMP package or another way to set up PHP. You might need to supplement our instructions with your own investigations. For help in installing and starting NetBeans IDE, please see the installation documentation. To start PHP development in the NetBeans IDE for PHP, you first need to create a project. A project contains the information on the location of the project files and the way you want to run and debug your application (run configuration). Start the IDE, switch to the Projects window, and choose File > New Project. The Choose Project panel opens. Figure 1. 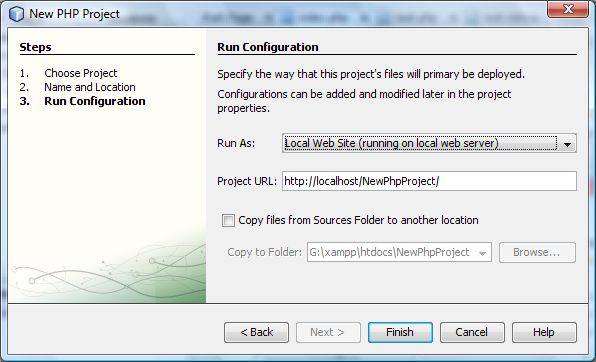 Name and Location panel of New PHP Project wizard, with Source Folder location as XAmpp document root. In the Project Name text field, enter NewPHPProject . In the Sources Folder field, browse for your PHP document root and create a subfolder there called NewPHPProject . The document root is the folder where the web server looks for files to open in the browser. The document root is specified in the web server configuration file. For example, on Xampp, the document root is XAMPP_HOME/htdocs. Leave all other fields with their default values. Click Next. The Run Configuration window opens. In the Run As drop-down list, select Local Web Site. The project will run on your local Apache server. Your other options are to run the project remotely via FTP and to run it from the command line. Leave the Project URL at default. Click Finish. The IDE creates the project. 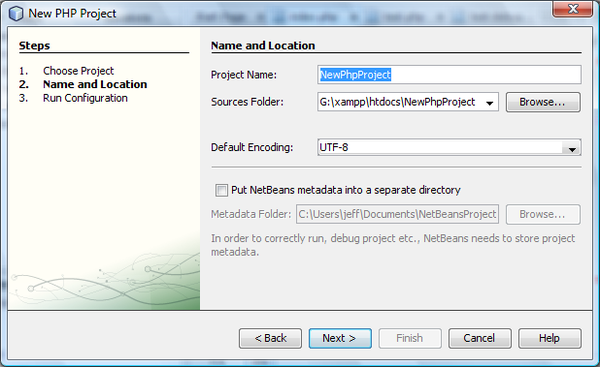 Learn more about Setting up a PHP project in NetBeans. Start the IDE, choose File > Open Project. The Open Project dialog box opens. Select NewPHPProject and click Open Project. The NewPHPProject tree appears in the Projects window and the project’s index.php file opens in the editor and in the Navigator window. You can use various database servers with the NetBeans IDE for PHP, although the most popular is the MySQL server. Downloads are available here.